Coconuts often remind us of well-deserved vacations and sitting in the sun while sippin’ on a cool pina colada! But fear not, you don’t have to travel far to enjoy the taste of this tropical fruit. That’s right, you can treat yourself year-round…like right now for instance! How? Forgo the drinks and combine coconut in recipes instead. Among the easiest to make and tastiest are these chocolate dipped macaroons, guaranteed to fly off the plate, platter, or pedestal. In a medium bowl, combine the dry ingredients: coconut, flour, sugar. In another bowl, beat the egg whites until the foam form stiff peaks. Carefully fold in the coconut mix. On a parchment-lined baking sheet, make little mounds with your hands placing them about 1 inch apart. Bake for approximately 18 minutes, or until golden brown. Take out and let cool on a rack. To melt your chocolate, pour into heat-proof bowl, and heat on top of boiling water. Stir constantly. Dip the bottom of each macaroon into the melted chocolate, and transfer onto a wire rack to set. If desired, you can place into the fridge for approx. 30 mins. So sit back, take a bite, and think of the tropics! Sometimes, we all need a little something sweet. So why not treat yourself to a home-baked batch of coconut/pineapple macaroons? This crunchy-on-the-outside, chewy-on-the-inside snack will not only make your kitchen smell like a tropical paradise, but will taste like it too! 2. Beat the egg whites until fluffy, then add the sugar, flour, and vanilla essence, and keep stirring until dissolved and the mixture regains its thicker consistency. 3. Combine with the coconut and diced dried pineapple, mix well. 4. Scoop up the batter with a spoon, forming little mounds. Slide off and onto a baking sheet about 1-2 inches apart. 5. Bake for 15-20 minutes until golden brown. Let cool on a cookie rack. In a small pot, combine all the ingredients and let them melt. Stir frequently and let cool for 5 minutes. 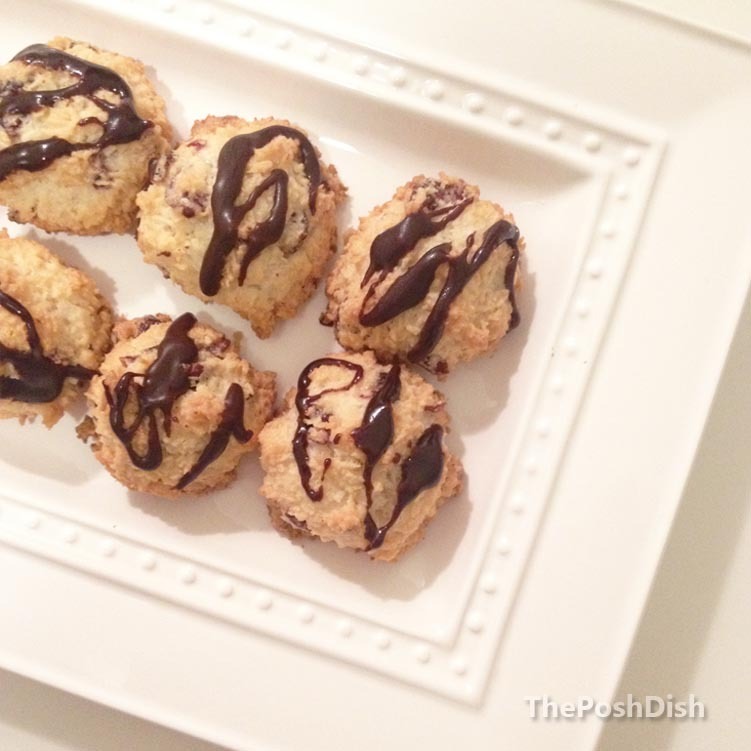 Then, drizzle lightly with a spoon over the already cooled macaroons! In the mood for something sweet? 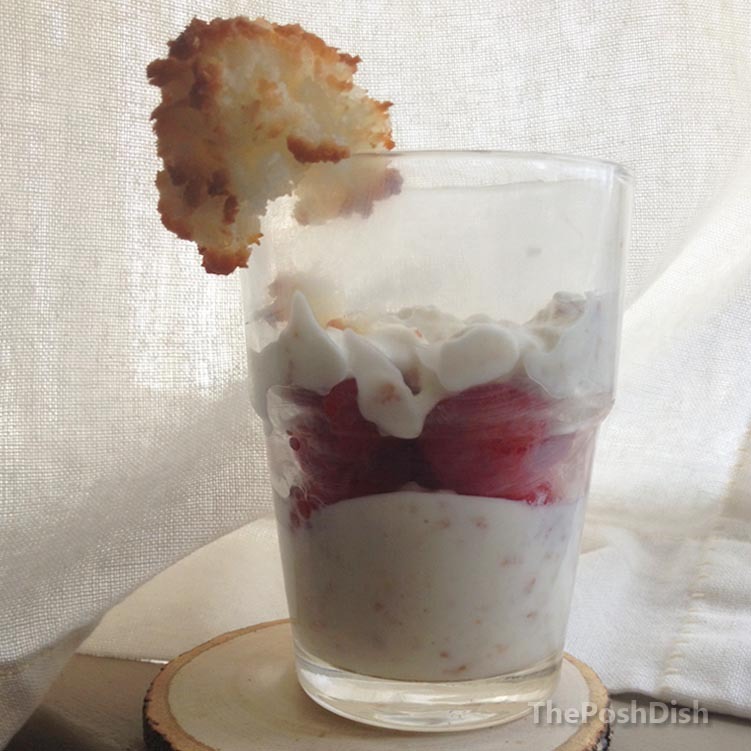 Then this coconut macaroon parfait is sure to satisfy. It’s fresh, fruity, and light –so you won’t have to make a guilt trip to the gym. 2. In a separate glass or whatever you have chosen to serve the parfait in, layer one scoop of the yoghurt macaroon mix, one of raspberries, and another of the yoghurt. Well, that was easy! It’s also relatively low in calories, because it’s made with yogurt and not vanilla pudding or more decadent alternatives. But rest assured, you’re not sacrificing flavour with this substitution. 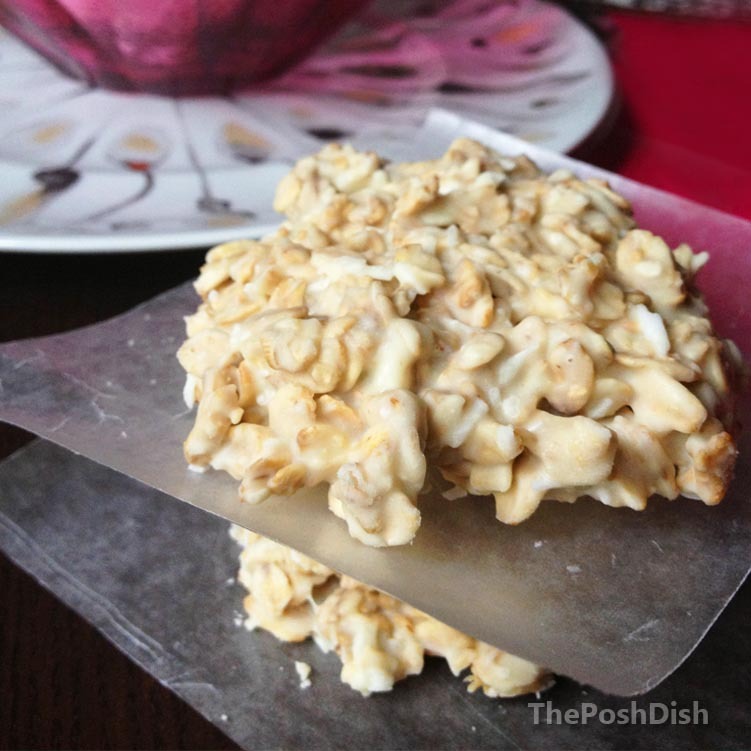 These white chocolate granola-coconut cookies can be made in minutes, and will probably fly off the plate just as fast. They’re also a great way to get your grains, so rest assured that this is a guilt free treat(even if you serve them with a side of sorbet)! And let’s be honest, baking cookies can get messy with so many pots for dry and liquid ingredients. Not to mention, eating spoonfuls of batter instead of scooping them onto the baking sheet is inevitable –especially when it’s as yummy as the one for my orange-almond cranberry clusters. To save yourself the agony, try this easy to make alternative. 1. 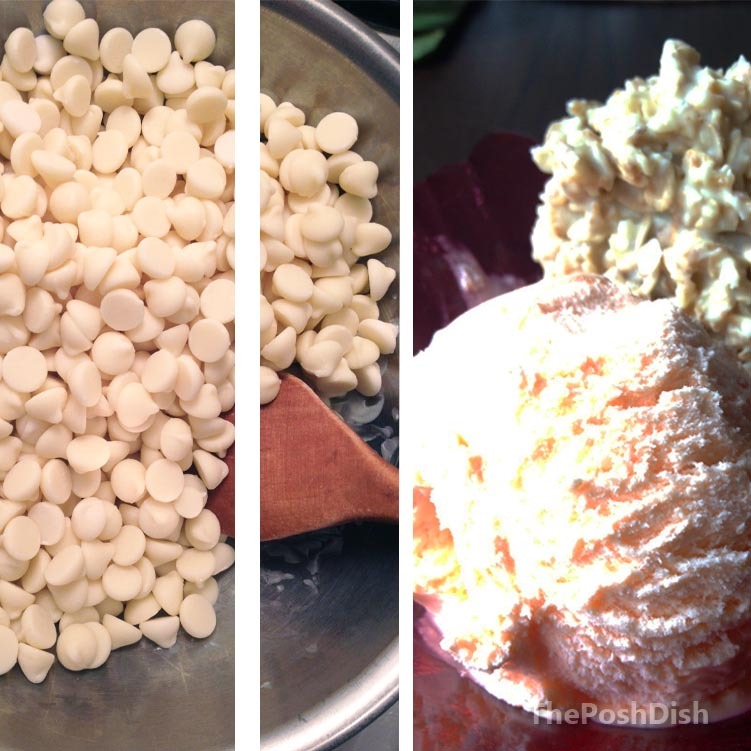 Melt the chocolate chips in a double boiler, or place a steel bowl on top of a pot of boiling water. For an easy way out pop them into the microwave, stirring occasionally. But to be completely honest, stove top is the way to go! The chocolate will retain its rich texture and won’t even come close to burning. 3. Line a baking sheet with greased parchment paper, and place spoonfuls onto it. 4. Leave them in the fridge for 2 hours or so, until firm. Take them out a couple of minutes before you’re ready to enjoy them, and let them sit out to thaw. No bake. Quick to make. Good for you! Need another reason to try out this recipe?